MILPITAS, CA--(Marketwire - January 3, 2011) - Sigma Designs (NASDAQ: SIGM), a leading provider of System-on-Chip (SoC) solutions for delivering entertainment and control throughout the home, today set a new bar for advanced connected media players, Blu-ray players and IPTV set-top box (STB) SoCs with the introduction of its SMP8910 media processor. 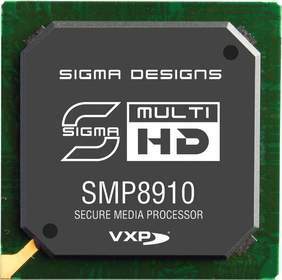 The SMP8910 is the first chip to integrate VXP studio quality video processing and the most flexible 3D video processing into a high-performance media processor. The SMP8910 provides more than 6,000 DMIPS via a dual-core 1004K MIPS CPU -- achieving real-world performance never before possible on a STB SoC. The chip's unique distributed processing architecture features task-optimized CPU that manage key processes, including HD multi-format video decoding, 3D graphics rendering, content protection and security management and multi-format audio encoding and decoding. This highly optimized architecture leaves more than 3,000 DMIPS of available processing to smoothly run middleware, STB applications and the latest over-the-top (OTT) applications. "The SMP8910 is a powerhouse chip that gives OEMs and ODMs the processing power to completely redefine the television experience and offer customers a visual experience that is years ahead of anything available today," said David Lynch, vice president and general manager, Media Processor Group at Sigma Designs. For the first time, VXP, the de-facto standard for studio and professional level video post-processing, has now been included in a media processor chip. VXP technology creates a rich, studio-grade viewing experience and is proven in demanding applications such as digital cinema projectors, prosumer AV receivers and processors, broadcast monitors, and premium quality Blu-ray players. VXP is superior at up-scaling images, eliminating noise and video compression artifacts and performing numerous image enhancements such as adaptive contrast and detail enhancement. The SMP8910 also includes two new VXP features: de-ghosting and adaptive de-banding. De-ghosting reduces ghosting artifacts present on most current 3DTVs by pre-processing the 3D video before driving the 3DTV, resulting in a more pleasing and less fatiguing viewing experience. Adaptive de-banding reduces color contouring, commonly seen as bands of color instead of continuously smooth shading, resulting in a more pleasing image without loss of detail, especially on large displays. The SMP8910 is the SoC of choice for OEMs looking to build 3DTV-enabled, advanced connected media players or premium Blu-ray devices and recorders. With support for H.264 Multi-View Codec (MVC) decoding, the SMP8910 enables full HD resolution 3D video per eye. In addition to MVC, the SMP8910 also supports the decoding of and conversion to multiple other 3D formats such as Sensio, RealD, TDVision, checkerboard, side-by-side, top bottom, anaglyph and more. The SMP8910 is also excellent for content streamed over the Internet by service providers. By combining MVC decoding and VXP post-processing, service providers can now transmit full HD 3DTV without increasing bandwidth or decreasing video quality. Plus, consumers will be able to enjoy streamed Internet TV content such as Netflix and YouTube at a higher quality than rival systems since the VXP technology reduces many video quality issues. "We have a two-pronged strategy," said Thinh Tran, CEO of Sigma Designs. "First, we create standalone products that dominate their category. That's what we have done with VXP and with our SMP-branded media processors. Then, we integrate our industry-leading technologies together to create a true next-generation solution that can't be easily copied by competitors. This is what we have done with our SMP8910." "The SMP8910 combines Secure Media Processor architecture with VXP video processing technology to provide a solution for next generation STBs, DTVs, and other video products," said Michael J. Palma, senior analyst for Consumer Semiconductor research at IDC. "This combination of technologies supports future trends in video technology, at the intersection of HD and 3D video and Internet access as consumer content consumption progresses to the next level." SMP8910 samples will be available to customers in the first half of 2011. Sigma Designs is a leading fabless semiconductor provider of highly integrated system-on-chip (SoC) solutions that are used to deliver entertainment and control throughout the home. SoC solutions include media processing, wired and wireless networking, video image processing, and home control along with system software to form the critical components of consumer electronic products that include Internet protocol TV (IPTV) set top boxes, gateways, Blu-ray players, and media communication devices. Headquartered in Milpitas, Calif., Sigma Designs has direct sales representatives in the United States, Brazil, China, Europe (Denmark and France), Israel, Japan, Singapore, Taiwan and distributors in Korea, Russia and India. For more information, please visit Sigma Designs' web site at www.sigmadesigns.com. Sigma Designs, VXP, Secure Media Processor, and the Sigma Designs logo are either registered trademarks or trademarks of Sigma Designs, Inc. and its subsidiaries in the United States and other countries. All other trademarks mentioned herein are believed to be trademarks of their respective owners. This press release contains forward-looking statements within the meaning of Section 27A of the Securities Act of 1933 and Section 21E of the Securities Exchange Act of 1934, including statements about the anticipated features and benefits of Sigma's products and solutions. Actual results may vary materially due to a number of factors including, but not limited to, general economic conditions, including the rate of growth of the media processor, Blu-ray disc, VXP or OTT markets in general, the ramp in demand from Sigma's set-top box and telecommunication customers, Sigma's ability to deploy and achieve market acceptance for Sigma's products in these markets, the ability of its SoCs to compete with other technologies or products in these emerging markets as well as other risks that are detailed from time to time in Sigma's SEC reports, including our quarterly report on Form 10-Q as filed December 7, 2010. Readers are cautioned not to place undue reliance on these forward-looking statements, which speak only as of the date hereof. Sigma undertakes no obligation to publicly release or otherwise disclose the result of any revision to these forward-looking statements that may be made as a result of events or circumstances after the date hereof or to reflect the occurrence of unanticipated events.